A “cabal of interest” is arraigned against Mo Ansar, a conspiracy by “dark forces.” The articles by Douglas Murray, Nick Cohen, Milo Yiannopoulos, and Jeremy Duns (who have all linked to this blog) reveal a picture of someone not striving for peace, tolerance or unity. It is like there is a portrait in a locked room; while Mo Ansar is away mouthing progressive platitudes with Russell Brand, something less presentable has for most people been tucked away out of sight. Thanks to the internet, this sinister monstrous reality is hidden in plain sight, as painted by Mo Ansar himself. The latest exposes by the people above had the effect of putting the hidden portrait on public display, bringing its surreal depictions to a much larger audience. I have never written my full view of Mo Ansar, but rather commented on his views, behavior and credentials in about ten posts (out of nearly a thousand total). Why should we question the credibility of a man who just wants to serve the community? I try to include points not already mentioned and highlight the ones that need restating again. This is a round up of all our pieces, and hopefully now the story is out, the last time I feel compelled to write about him. Mo claimed that the tweet was out of context when brought up by critics, but he refused to give the context. I therefore wrote a post on the context and critiqued the link he had provided. Mo claimed Islamic slavery was not slavery as we would understand it, because of how they were treated. My retort was if you own a person who you can sell and trade, it is slavery, and therefore oppressive. He was offered a right of reply. He accepted and then a few months later turned down. As you can read about here. The post by then had gained traction, as had Mo’s tweet which was parodied as above. I was surprised by Mo’s stance defending slavery in the Islamic world as not being slavery. It had no bearing on the history of what we know took place, nor reflected what was the common practice at the time. Bottom line: a person being owned is oppression by itself, and is enough to condemn the concept of slavery in any age. This is deflected as suggesting he is for slavery in the here and now. This was about historical revisionism and apologetics. Remember Mo Ansar claims to be a theologian and an educationalist. His claim of being a lawyer has been debunked with him apologizing (see here). He has never said where he received such academic training for the other positions of authority he claims. When presented by the media as such a person, the public expect a qualified expert. Not someone who just thinks they are one. I am told by a few people on twitter that Mo Ansar is a progressive. That image seems at odds from his 2006 post where he reveals himself to be a 9/11 conspiracy theorist and states Israel is a terrorist state part funded thanks to the holocaust, and that by God they should have no homeland. Today we have the global media network, main stream media, corporate oligarchies and capitalist free markets economies. All perceive a threat by the advent of Islam. We have no conclusive proof of who committed 9/11, why the towers were ‘pulled’, why airplanes were modified, why steel melted at 800 degrees not 2,300 or the relevance of ‘Operation Northwoods’. The pleas of the families for an inquiry are denied and the evidence has in the majority, been completely destroyed. However, any straw poll will almost entirely state it was the Moozlims. The Muslims of today are being put under an intolerable amount of suffering; they face persecution and oppression the world over in almost all of the high-Muslim population countries. Imperialistic forces continue the age old tried and tested tradition of divide and conquer. Hand in hand with a war of words, a battle for the hearts and minds of the West, a continuing aggression against the Muslim world. Israel, arguably a terrorist state, is overwhelmingly core funded through the US and holocaust reparations. We need not list Israeli atrocities other than to say that according to the Book of Moses, the Jews are utterly prohibited from oppressing another people, having been oppressed themselves. They are meant to wander without a land. They are in the main European, Ashkenazim, Khazar, non-Sephardic and non-Semitic Jews. 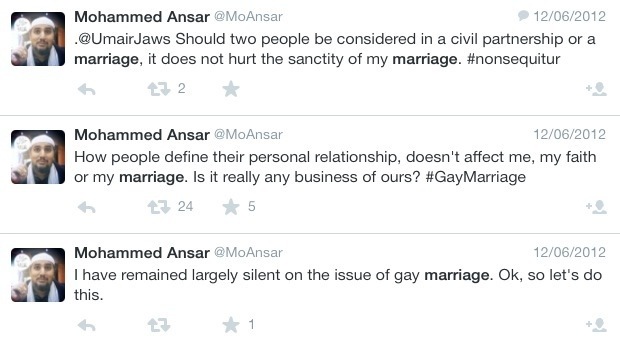 Mo Ansar has said that Islam is not homophobic, and that he has campaigned as a civil rights activist all his life. He has been blogging for around ten years (though absent last year). Not a single blog post exists dedicated to gay rights and Islam. We actually have to go to twitter to find his views. 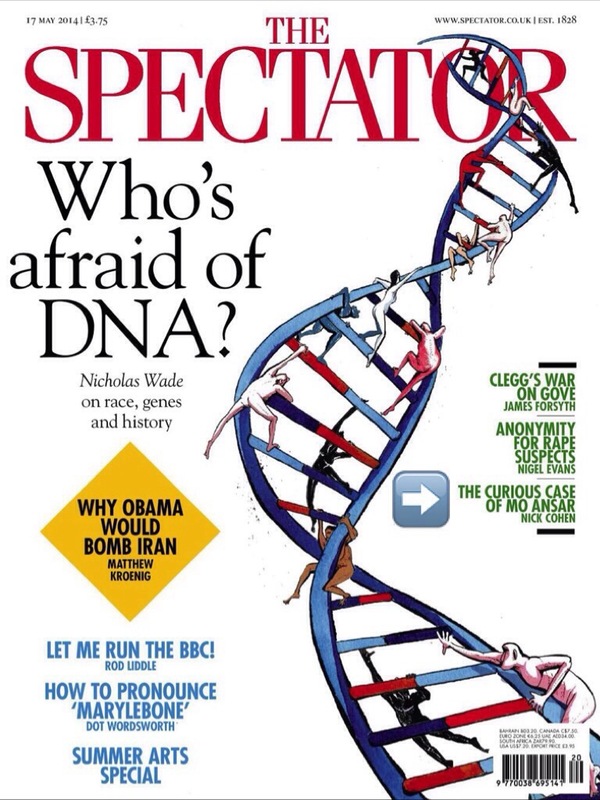 This one issue is enough for people to see Mo Ansar as a progressive. But when we look at his views on slavery, Israel, 9/11, or views on history, the persona is more one geared to gullibility and sensationalism. It is one reason his accusations of dark forces and cabal interests, coming together to thwart him, are part of a conspiracy mindset. We disagree with someone that uses social and public media, by using those very same platforms. It cannot just be disagreement in the conspiracy world Mo lives in. According to court documents, Ansar’s failure to honour a debt to Lloyds TSB – a staff loan – appears to be what kicked off a 36-day employment tribunal and launched him into a career of dishonesty and special pleading in the early 2000s. He did not repay the money he owed, and when his manager launched a compliance investigation he accused that manager of “racial discrimination,” “victimisation” and “harassment.” He later accused the bank of “tampering” with data files, a claim rejected outright by the judge. Many appeals later, after numerous failed allegations of bias against the chair of the Tribunal from Ansar, the case was thrown out by the Supreme Court before three Lord Justices, including Leveson, at massive cost to the taxpayer. In an earlier appeals judgment, the judge noted that Ansar found it difficult to take instruction from female superiors, had undertaken “sloppy” work for the bank and had lied in a letter pertinent to the case. 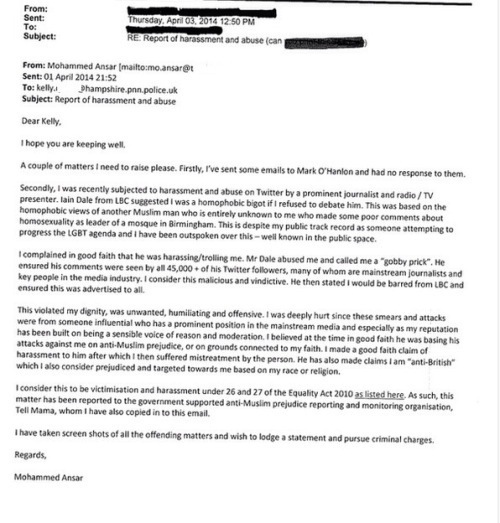 Mo Ansar reported Iain Dale to the police on 1 April 2014 for racial and religious hatred for banning Mo from his radio show and calling him a “gobby prick” on twitter. The police, and TellMamma which monitors hatred towards Muslims, both dismissed his complaint [sent by him below]. When a petition was set up calling for Nawaz to be deselected by his party as a candidate, Ansar tweeted a link to it fifteen times, and discussed it many more online and in the media. Many condemned him for this, pointing out he was fanning the flames of extremism and could encourage death threats against Nawaz. Mo Ansar breezily condemned the death threats, but carried on campaigning against Nawaz on the cartoon issue anyway, despite being unable to say that he found it offensive himself when directly challenged by David Aaronovitch on radio and by Nawaz himself on Newsnight. Thankfully, nothing came of those threats – but it might have done. Had anything happened, Mo Ansar would not have been solely responsible, of course, but in my view he would have been partly so. It was a malicious and potentially extremely dangerous thing to do. And he knew he was doing it. Nawaz had previously invited Ansar to condemn sharia sanctioning chopping the hands off a thief – Ansar obfuscated and, oddly for someone introduced as a theologian by the media, said he would want to see what other scholars said (note on The Daily Politics today he does call such punishment “abhorrent” – if only the follow up question was should it still happen in an Islamic state?). Unlike Nawaz in the documentary, he could not say no to sharia being implemented without considering whether it was Islamic and therefore legitimate to do so. It appeared like religion being put before being humane by Ansar. 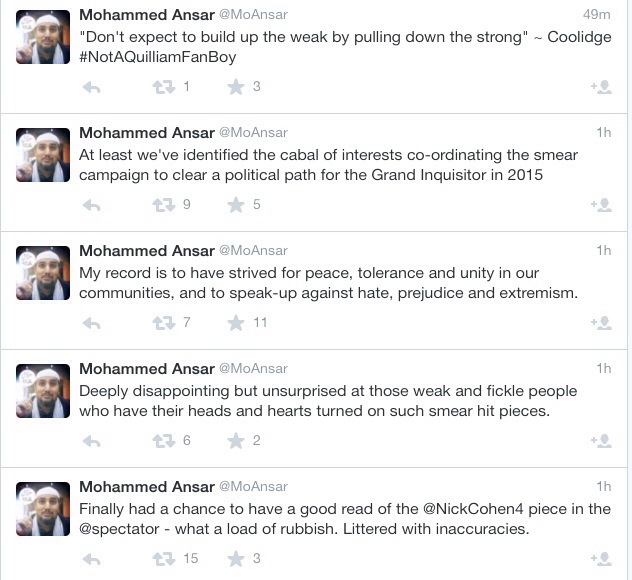 Maybe Mo Ansar looks to create further division by saying that this is all a smear campaign by Quilliam. After all, when flaming the passions of Islamic blasphemy and sectarianism, this is what a peaceful tolerant unifying person does without irony. What we had been tweeting and writing in the blogosphere finally had reached the ear of professional writers above. With Nick Cohen it hit print media (arrow added below). The portrait we have unveiled is of a man consumed by the desire to be in the media spotlight, but this picture is the work of Mo Ansar by his own words and deeds. It includes the surrealism of being a lawyer, conspiracy theories and paranoia. In the video above with Russell Brand, Mo Ansar states what he does is serve the community and that the message of Islam is to have a soft heart. What he does not mention is that as well as good actions this must include good intentions – namely your service to the community must be to praise Allah, not your own public image. Whilst Mo Ansar claims to see into my heart, I cannot claim to look into his. All I know is that his behavior in dealing with critics such as Iain Dale, and his stated views outlined above, coupled with his behavior, make him someone not to taken seriously anymore. I think one interesting characteristic of Ansar is the way he really disliked, and was disliked by, so many liberal secular types who are not anti-Muslim bigots (and some of whom are Muslim). I think the moment I decisively turned against Ansar was when he tried to persuade me that Jamie Bartlett was a bigot. It seemed as though anyone who viewed him, or his exposition of Islam, with scepticism needed to be categorised as Islamophobic, and shunned. I almost think Mo Ansar went off the boil because he felt he had made it. Things move so fast in media goodwill is an important thing – reporting a broadcaster to police might have killed that. 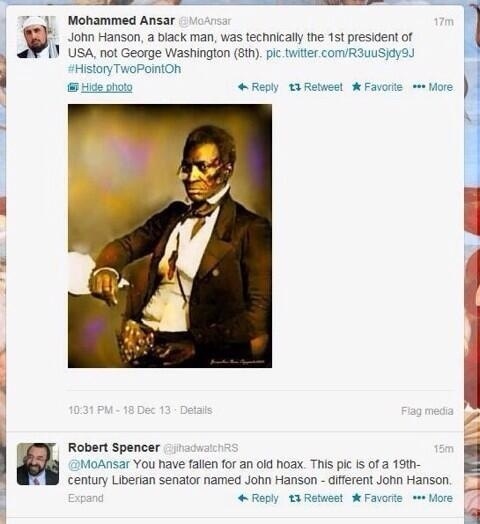 Sarah i’ve followed Mohammed Ansar for about a year, read his tweets and the reply’s which John Sargent does not show. Also i have sometimes seen clear set ups by “liberal secular types” then tweets photographed and spread around twitter by racists and anti muslim bigots. The cyber bullying of one man has been relentless and instigated by people who really know better but choose to use their interlect and play on words to incite hate. John Sargent i am glad you say this might be the last time you write about Mohammed Ansar.Theirs alot of wolves and wolves in sheep clothing about on twitter with a badminded agenda and i think Mohammed has been victim to a pack of them.Disclosure:Just my opinion based on what i have seen i am not a sock puppet. Charlotte these tweet screen shots in post are mostly beyond a year old (when you started following Mo Ansar). They are also mostly not replies, but stand alone tweets. You also neglect other Muslims disagree with Mo Ansar as I have on the same things. Do you have no issues with his blog post on 9/11 or Israel? Or that Jesus was not Jewish but Hitler was partly? Or take on board Tell Mamma and the police dismissed Mo’s claims against Iain Dale? As I am on good terms with Muslim organisations like Tell Mamma, hopefully you can distinguish between disagreeing with Mo Ansar and demonstrating the case, with those who have hurled sick abuse. It might be difficult, as it has been for others taken in by Mo Ansar, to come to terms with the evidence. But there it is in his own words. How you deal with it is entirely up to you. Ignoring it is no longer an option for most people. Thanks for this. I have long had a dislike of Mo Ansar based on nothing more than a gut feeling. It is good to find that my b***sh*t detector is still calibrated correctly. Meanwhile it has been twitching over the Olive Tree School featured in the news over the curtailed Ofsted iInspection due to the children being asked about homosexuality. The school website and trustee profiles make interesting reading. Until last week I had never given Ansar a second thought. I have no particular interest in Islam or any other religion, and I do not (for example) write about middle eastern politics (for the simple reason I know almost nothing about middle eastern politics). So I stumbled in to all this as an outsider. What alerted me was Jeremy Duns’ main Twitter account being suspended (I noticed this because Jeremy’s reserve account came into my timeline). I then saw Ansar was ignoring requests to clarify whether he was responsible for this suspension. As I had no previous dealings with Ansar, and as I have an account with sufficient followers that it cannot be easily ignored, I repeated the query to Ansar about Jeremy’s account. But no answer came from Ansar. I then decided to look at Ansar’s website and saw the curious claim that he was a “legal advocate”. This is a vague term, and it could mean (for example) a so-called “McKenzie friend”. However, it was not clear. But what was clear was that this claim was being about the highest courts in the land, located at the Royal Courts of Justice (that is, the High Court and the Court of Appeal). Now this was odd: most McKenzie friends normally work in the drab county courts and family courts: not on this elevated level. So I asked Ansar about this. But still no Ansar from Ansar. Then Jeremy tweeted me a search of Ansar’s tweets about courts. And the scale of his “legal” claims was astonishing. The claims went beyond being a “legal advocate” to being a “lawyer” (I saw afterwards he also claimed to be a “jurist”). As a lawyer he regularly cross-examined. And he claimed to have appeared four times at the Court of Appeal. This was now looking distinctly strange. What convinced me of the falsity of the claims, however, was his repeated attempts to attribute to Lord Justice Leveson a statement about judicial bias which Leveson simply would not have made in court. At this point I was satisfied Ansar was some sort of fantasist. So I asked Ansar again. And then two answers came from Ansar. First was an allegation of “harassment”. This fell flat. I had been very careful in framing my questions. This admission had two immediate discrediting effects. Second, it undermined his various other claims. In a way, it was a significant part of the dam to break. But I am part of no conspiracy. I have no interest in what Ansar generally writes and speaks about. Had it not been for the suspension of Jeremy’s account and the easily assessed claims of being a “legal advocate” I would not have had any role in this at all. It has been bemusing to see all what happened last week. (I was even harangued on Twitter by a “Mr Man” account, which I suspect is Ansar himself.) I have been horrified to learn about the stirring up of the death threats against Nawaz (about which I did not know when I asked my questions). And I have also now seen his legally illiterate and illiberal complaint to the police about Iain Dale (I had also not seen this either when I asked my questions). The truth is: Ansar is the author of his own misfortune and, as such, he only has himself to blame. Anyway, kudos to John Sargeant for having plugged on with all this for ages with what was some excellent blogging. To his shame, he couldn’t say this in the Tommy documentary (possibly in panic about the possible backlash he did eventually receive from some Muslims when he did condemn it), but that seems to be his position now. The other thing that needs saying is that Mo’s primary reason for contacting the police over Iain Dale was that Mo interpreted Iain to be suggesting he was a homophobic bigot because he identified as Muslim (in my opinion this is at possibly part of the reason behind Iain’s questions/suggestion – the thread can be seen on Iain Dale’s blog – but I can see why Mo saw it this way). You don’t mention this, but it can be seen in the letter you screenshot. His secondary complaints that being publically banned from LBC constitutes harrasment etc were indeed totally frivolous. Now that those are out of the way, I do pretty much agree that Mo doesn’t deserve his frequent media attention, simply because he is demonstrably dishonest (cv infation) and very foolish (conspiracy theories, other ludicrous theories). He did serve a useful purpose to an extent, in that he was a visible case of an approachable Muslim who is not homophobic or wishes harm upon apostates etc., which makes it harder for anti-Musim bigots to suggest that all Muslims have such intolerant views. But now that he has rightly been exposed for his bizarre views and cv inflation, his credibility is very publically in tatters and he can no longer even serve that purpose. The one major aspect of the wider criticism that I do take exception to is the suggestion by some (such as Harry’s Place) that Mo is some sort of Islamic extremist, that he promotes Hizb ut Tahrir or their views. I found their evidence ‘extremely’ thin, sometimes imaginary when checked. It’s pretty ridiculous. Given that a hell of a lot of Muslims are used to compartmentalising things, will defend and sugar coat past slavery when pressed, because to condemn it would in their eyes mean throwing out the faith entirely, doesn’t make them extreme in the sense of a danger to anyone or liable to encite people to become dangerous. It’s not like he’d advocate slavery, hand chopping today. I’m wary of a general trend to attempt to lower the bar of who is labelled an Islamic extremist in some quarters (not this blog, as far as I recall). I don’t particularly care if a large proportion of Muslims today will defend certain things in the history of the Islamic world, so long as they are not actively calling for certain aspects of sharia or engaging in bigotry today. There are far more worthy recipients for the label of Islamic extremist. Yes I’ve deliberately not accused Mo Ansar of being an extremist – he is enough other things. How the slavery/hand chopping has been spun let’s him off the hook of what he actually said. Whilst we are used to religious apologists, Mo does go beyond that label. Greg – I agree that these categories are rather unstable. Ansar is difficult to categorise because he flip flops between liberal and conservative (but never *extreme* exactly) so confusingly. Where on Harry’s Place did you find him mischaracterised exactly? I’ve just reskimmed this post, and it doesn’t seem to paint him in quite that light. I mentioned him myself today, in his capacity as an iERA apologist. He tweeted one upcoming HT event (not events plural), which was just a debate about the cartoon saga (we already know Mo’s position on this), hardly a general HT endorsement. The article also links to a tweet *from* a HT member about gay marriage, but there’s no sign looking at the tweet that Mo actually retweeted or endorsed it. As for his position on segregation, he was advocating that all views should be accomodated (alluding to the segregated and mixed sections at the iera event). Though I disagree with what iERA did at that event, to suggest Mo’s an extremist or alligned with them is hardly deserved on that basis. So there was basically nothing there of substance. A pathetic and disceitful article given the evidence presented. This article was linked to by Jeremy Duns and Milo. Thanks, John – I read that report earlier today – it’s excellent work and I hope some of the many universities where iERA still hold events take notice! But as far as Mo is concerned, his stated interest in defending iERA was because of their anti Islamophobia work (not that they are very effective at this, clearly!). I know that while full of s*** in just about every other respect, Hamza Tzortzis has often urged his Muslim followers on social media towards better interactions with atheists etc. This is the kind of thing Mo is interested in. It doesn’t imply that Mo supports their extreme views as exposed in the report. iERA present a rather different public image that has long fooled some who aren’t well acquainted with them, including Mo, apparently. Thanks Greg – yes, I’d emphasise different issues with Mo (I mean different from that HP post) although I think the fact he has been careless with his dealings with extremists, and that is rather unfair on the many genuinely liberal (or at least secularist) Muslims who are a bit more alert to these matters. Sorry that was rather garbled. I meant – the fact he has been careless with regard to extremism is unfair on those Muslims who are genuinely liberal, and more careful. I agree, Sarah. I also have to admit, in the past hour or so I’ve done some better checking and I have to backtrack on some things, my remaining sympathy for Mo ebbing away. First thing I’ve learned is that he has a habit of deleting tweets that might land him in trouble, including retweets and that this would remove any signs that he retweeted something. Thus it’s possible that he retweeted the gay marriage thing from that Hizb ut Tahrir guy (given that the HP article links to it), though I’d have expected some tweets from his critics replying to it. Right now my hunch is that he’s currently a fairly progressive Muslim in some respects, with occasional lapses, but has some sympathies with Islamist political narrative and should totally distance himself from HT, even if he thinks having a friend in that camp somehow helps him when under attack from Muslims. And on a personal level he clearly has a lot of flaws (dishonesty, Majid revenge, seeing any critic of him or Islam as Islamophobe/neocon, though he does actually suffer from such types too). Not the sort of representative progressive Muslims need. It’s a wonder he hasn’t gone completely mad yet, sitting in a crossfire from liberal non-Muslim critics, the far right, and many Muslims! Anyway, I’m now sick of talking and reading about Mo Ansar so I’ll leave him to his fate! Sorry to burst your bubble Greg, but Moansar has had closer ties with Hizb ut Tahrir than you suggest. Some would say he also promoted them on Twitter on a few occasions. Certain tweets (some dated 2011) have since been deleted, and retweets untweeted! Some on twitter think I was actually being hard on him … think you’ve seen the rabbit hole goes deeper then can initially be imagined. I agree with Greg’s evaluation of Mo Ansar, pretty much. I do feel sometimes he obfuscates his position – seeming to support something very illiberal then switching – in order to deliberately wind people up. I contrast him with another liberal Muslim, Fiyaz Mughal, who also gets attacked from all sides in the way Greg describes WRT Ansar, but who responds by trying to get as many people on board with his project (anti-Islamophobia Tell MAMA) as possible. He does get very angry with the real anti-Muslim bigots who attack him, but he’ll nearly always try to engage with the kind of liberal, perhaps slightly ‘Islamosceptic’ types who can’t stand Ansar. While I wouldn’t call Ansar an extremist, his views (for me) lean towards being an apologist for, or a deflector of extremism, whether he actually means to or not. Ever since I followed him on Twitter and realised his assertions of “unity, tolerance and civil-rights” didn’t meet the same definitions as mine, I’ve waited for him to redeem himself, but it has never happened. Sometimes it seems like a fantactical desire to protect the perfectness of Islam, as he sees it, that he has to support and promote various things that destroy the “unity and tolerance” he claims to profess. It might seem trite, but he reminds his followers at Christmas and Easter that Jesus was actually a Muslim, and there was no ressurection. While this is obviously the Muslim angle on the story, why tweet that deliberately at those times? It kind of dilutes his “Inter-faith leader” persona. After Woolwich, his assertion that the EDL were the biggest extremism problem the country faces was pure deflection away from the extremism displayed at Woolwich – something he has never tackled head on, but simply given a few “condem” platitudes, before masking it with the EDL assertion. He had every right to write about the EDL, but it was the way he used it at that time in order to deflect. And who knows whether his “promotion” of the EDL back then was simply because of the documentary he was secretly making at the time? Islamist objectives or celebrity objectives? His attacks on “The West” and Israel on Twitter seemingly became more frequent, unless he’d done that with the same frequecy before I’d encountered him. His assertion that we should stop focussing on integration and focus on contribution (of the Muslim community), was strange. Contribution is one thing and is to be welcomed, but integration is a different subject, so why link them, unless you are anti-integration? Just another of those things where you don’t get a straight answer from him. But many of these things (and loads of others) had me comparing his views with some extreme views. How different are they? Many times, it sounds quite the same, but delivered in a softer, vaguer manner. Having said all that, my jury is still out on whether Ansar would be leaping for joy if the UK was an Islamic state in 10 years, or in the absence of that, he secured a guest appearance on Stricly Come Dancing. Interesting. It clearly serves the public to highlight Mo’s false credentials. In addition to this I would argue that it is perhaps worth trying to understand the journey that he seems to be travelling along a little deeper, which might afford him a little charity. It appears to me that Mo is in the process of transition as exemplified by his change in views on homosexuality and capital punishment. As with many thinking British Muslims who hail from an orthodox/ conservative mindset, he probably finds himself in a tension between the narrow dogmas that he was reared on and the subtleties of making sense of the reality that there is much good in the non-Muslim world and equally a lot of darkness in what has been idealised within received Islamic teaching. I can just look back over how much my own values and understanding has changed in the past fifteen years and appreciate a lot of what Mo says today. Mo is no doubt a bag of contradictions, as are we all – do you think you are not? In some ways he has shown himself to be a phoney but in other ways I think that the liberal notions that he professes are genuine and a refreshing breeze, hailing from an orthodoxy which still remains incongruously conservative. What this also suggests is that it would be quite unfair to condemn Mo for opinions he held even three years ago, let alone a decade ago. Like my own, I can see that his mind is in flux and all you should judge him on is what he believes today. I just ask you afford him the same charity I would hope for myself! Having the humility to change your thinking is still a virtue, even if you can’t bring yourself to say sorry! Do read my piece linked to at behinning of post. His views, and attempt to victmise people he disagrees with on a regular basis mark him out as a bullying charlatan. I have also seen Mohammed in “transition.” He has moved away from the happy-chappy “moderate” on TV, always starting with a self-depreciating comment, to someone with much harder views. It seems not a week goes by when he doesn’t denigrate “The West” for either current affairs, or things that go back a few hundred years – even to the crusades. It’s not the language of the moderate – quite the opposite in fact. His first view on the Taliban atrocity was to start by saying that the West armed and trained them. He has similar subtle ways of speaking about ISIS. He “implies” things, but always has a get-out of non-directness. How does this inter-faith champion deal with Christmas every year? By tweeting about the “real (Muslim) Jesus,” and how Christians actually don’t follow Jesus at all, but Paul, and how Jesus was a Palestinian. If some of these are theological debates, let him properly do that, rather than choosing, every year, to take this opportunity to show us why there is such a division between Christianity and Islam. I’m no Christian, but it’s obvious to me that it’s insidious and divisive. Try and criticise Islam with him, and what would you get? He’s also taken to retweeting Hanza Tzortis articles – palling up with iEra, who have some of the strongest views. I’m not fooled by his otherwise pious tweets, and “I love this country” etc, because it has hypocrisy written all over it.